The the purpose is to carry the transit traffic, which otherwise has to pass through the city what caused daily traffic collapses. It is a well under construction dual carriageway, grade separated road with controlled-access, designed for high speeds. When constructed, the bypass will have three traffic lanes and an emergency lane in each carriageway. In 2012, a tender for construction was announced. Construction works were expected to begin in 2013, but due to litigation the contract for design was signed in February 2014. Finally, after a long wait due to land expropriation issues, the works for the North Tangent have started in February 2015. Total length is 16,54 km. There are technically complex bridges, road embankments and bridge abutments. Due to term for implementations of the contract some parts of the highway had to be redesigned. In original design bridge abutments and wing walls were designed as RSS built from small facing concrete blocks and geogrids. But from installation point of view to install approximately 25 000m2 of face was time consuming solution. The client choose the MacRes System with ParaWeb for the simplicity and speed of installation. 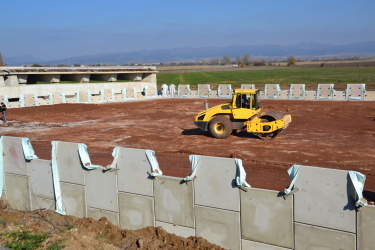 System of concrete facing panels and polymeric strip reinforcement was suitable for vertical walls, with its connection and the installation procedures, are quicker and easier to install, which further enhances the cost advantages on projects. To speed up the construction moulds for concrete panels were delivered to precast plant in Sofia. Contractor could coordinate production and delivery of panels on jobsite by himself. Nowadays bridges are built and all the walls are under construction. The installation has been proceeding fast and walls will be completed very soon. Whole Northern Speed Tangent should be completed in the end of 2016. For more informations about this project please contact us.